Tis the season for something a little special, and this French classic is just that. The first thing to do is remove your eggs from the fridge so they’ll be at room temperature by the time you poach them. Slice some thick cut bacon into ¼” pieces and cook in a heavy pan over medium heat until it starts to brown then remove from the heat. While you’re bringing a couple inches of water, with a splash of white vinegar or pickle juice, to a boil, rip your frisee into bit size pieces and put in a large salad bowl. Put the bacon back on medium heat, stir in a minced shallot followed by a few splashes of red wine vinegar. Leave it on the heat to reduce while you poach the eggs. Crack your eggs individually into a small bowl and gently pour them into the simmering water one at a time. Simmer for approximately two minutes, or until the yolks are to your liking, then remove the eggs from the water with a slotted spoon and place on a warm plate. 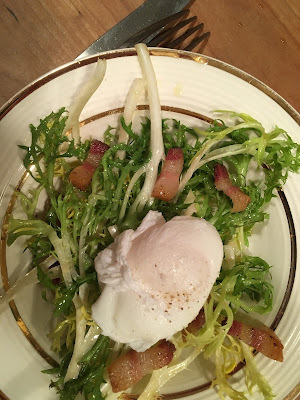 Quickly toss the frisee with the warm bacon vinegar, salt and pepper to taste, then plate and top with a poached egg.